3 Depression has many causes, and it has cures Everyone at some time feels sad or feels grief after a loss. Minor ups and downs in your emotions are normal. Depression is more than that. It is a serious medical condition, like diabetes, high blood pressure or heart disease. Depression can affect your thoughts, feelings, health and behavior every day. It s not something you can just get over. Causes of depression Many factors can contribute to depression. Depression can result from: Your genes and family history Certain medicines Drug or alcohol abuse Other psychiatric conditions Other medical illnesses Extreme stress or grief If you have a health condition or suffer from ongoing pain, you may be at risk for depression. It s not your fault. Coping with an ongoing health condition or disability is difficult. With help, you can get better. Recognizing depression How do I know if I m depressed? It is not easy to tell the difference between symptoms of depression, symptoms of your medical illness and side effects of medication. Your treating doctor needs to make the diagnosis. It s also important to educate yourself, so we ve included a list of symptoms and a selfassessment you can use. These may help you decide if you or a family member needs to see a doctor. Here are some signs that you may be depressed: You feel sad or cry a lot, and the feeling doesn t go away. You feel guilty for no real reason, feel like you re no good, or you ve lost your confidence. Life seems to have no meaning; you feel like nothing good is ever going to happen again; you have a negative attitude a lot of the time; or it seems like you have no feeling at all. You don t feel like doing a lot of the things you used to enjoy, and you want to be left alone most of the time. It s hard to make decisions or concentrate, and you forget lots of things. You get upset easily, lose your temper with little things and overreact. Your sleep pattern changes. You start sleeping a lot more or a lot less. Your eating pattern changes. You lose your appetite or you eat a lot more. You feel restless and tired most of the time. You think about death; you feel like you re dying; or you have thoughts about committing suicide. 4 Self-assessment Use this chart to help determine if you might be depressed. Circle the answer that comes close to how you have felt in the past two weeks, not just how you feel today. Add the columns and get a total score. 1 Over the last 2 weeks, how often have you been bothered by any of the following problems? Not at all Several days More than half the days Nearly every day 1. Little interest or pleasure in doing things 2. Feeling down, depressed, or hopeless 3. Trouble falling asleep, staying asleep, or sleeping too much 4. Feeling tired or having little energy 5. Poor appetite or overeating 6. Feeling bad about yourself, feeling that you are a failure, or feeling that you have let yourself or your family down 7. Trouble concentrating on things such as reading the newspaper or watching television 8. Moving or speaking so slowly that other people could have noticed. Or being so fidgety or restless that you have been moving around a lot more than usual 9. Thinking that you would be better off dead or that you want to hurt yourself in some way Add Columns: Total: Is your answer to either question 1 or question 2 More than half the days or Nearly every day? If it is, you may be depressed. It is important that you get help. Please call your doctor to discuss the results of your test and how you feel. 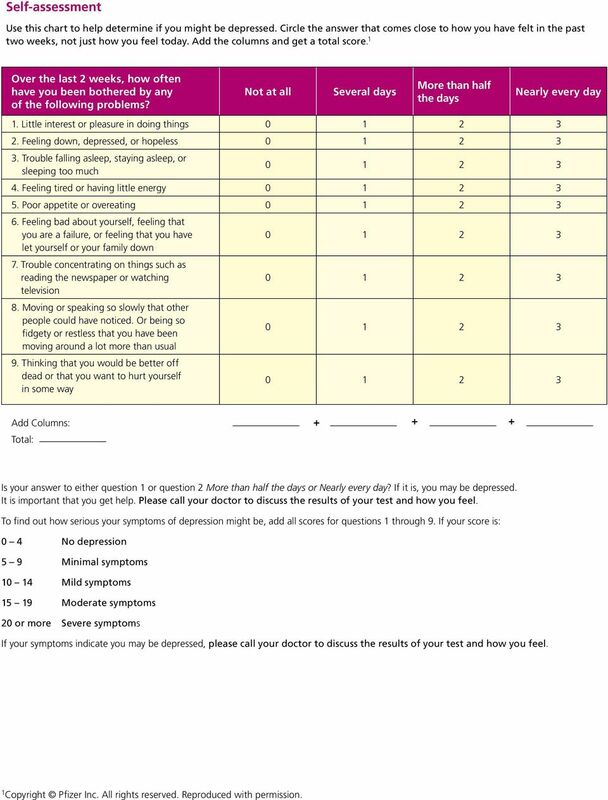 To find out how serious your symptoms of depression might be, add all scores for questions 1 through 9. If your score is: 0 4 No depression 5 9 Minimal symptoms Mild symptoms Moderate symptoms 20 or more Severe symptoms If your symptoms indicate you may be depressed, please call your doctor to discuss the results of your test and how you feel. 1 Copyright Pfizer Inc. All rights reserved. Reproduced with permission. 5 Depression is not a weakness. It is not your fault. Depression can be successfully treated. You can feel good again! Reasons why depression goes untreated Talking about your feelings is not always easy. Remember though, your doctors are there to help. It s just as important to seek help for mental health problems as it is for physical health problems. Nearly two-thirds of depression in general is not identified or treated. People may not seek help because they: Don t realize that they are depressed Have trouble asking for help Think being depressed is unacceptable Blame themselves for not feeling good Do not know that depression is very treatable Are so sick that they don t have the energy or even care about seeking treatment on their own Families may not offer help because they: Don t know the symptoms Don t know what treatments are available Think depression is normal for someone who is sick Doctors may not diagnose depression because: Symptoms of depression and other health conditions may seem the same Side effects of some medications may seem like depression Patients may not explain enough about how they feel 2 National Institute of Mental Health. Depression: A treatable illness. 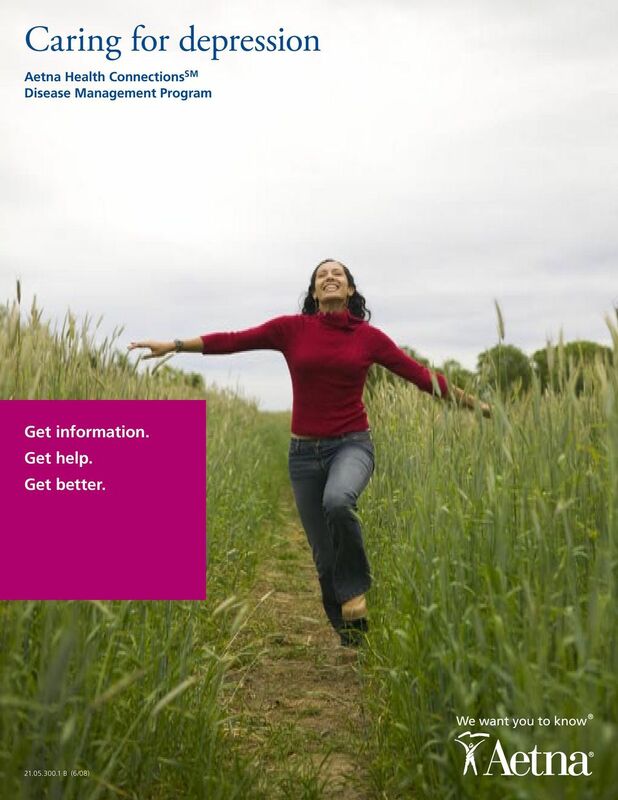 NIH Publication No Mar Seeking help Treating depression can actually help improve your medical condition. Your quality of life can go up, and your pain can decrease. Feeling better mentally can help you follow your treatment plan. In fact, some studies on people with diabetes found that as depression decreased, blood glucose control improved. 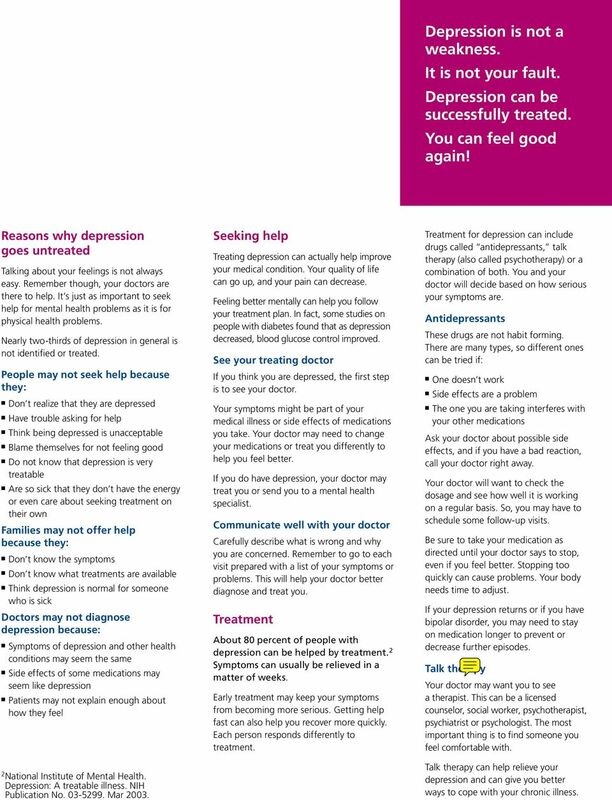 See your treating doctor If you think you are depressed, the first step is to see your doctor. Your symptoms might be part of your medical illness or side effects of medications you take. Your doctor may need to change your medications or treat you differently to help you feel better. If you do have depression, your doctor may treat you or send you to a mental health specialist. Communicate well with your doctor Carefully describe what is wrong and why you are concerned. Remember to go to each visit prepared with a list of your symptoms or problems. This will help your doctor better diagnose and treat you. Treatment About 80 percent of people with depression can be helped by treatment. 2 Symptoms can usually be relieved in a matter of weeks. Early treatment may keep your symptoms from becoming more serious. Getting help fast can also help you recover more quickly. Each person responds differently to treatment. Treatment for depression can include drugs called antidepressants, talk therapy (also called psychotherapy) or a combination of both. You and your doctor will decide based on how serious your symptoms are. Antidepressants These drugs are not habit forming. There are many types, so different ones can be tried if: One doesn t work Side effects are a problem The one you are taking interferes with your other medications Ask your doctor about possible side effects, and if you have a bad reaction, call your doctor right away. Your doctor will want to check the dosage and see how well it is working on a regular basis. So, you may have to schedule some follow-up visits. Be sure to take your medication as directed until your doctor says to stop, even if you feel better. Stopping too quickly can cause problems. Your body needs time to adjust. If your depression returns or if you have bipolar disorder, you may need to stay on medication longer to prevent or decrease further episodes. Talk therapy Your doctor may want you to see a therapist. This can be a licensed counselor, social worker, psychotherapist, psychiatrist or psychologist. The most important thing is to find someone you feel comfortable with. Talk therapy can help relieve your depression and can give you better ways to cope with your chronic illness. 6 Resources* As an Aetna member, you have plenty of places to turn for more information. You can even speak with a registered nurse on our Informed Health Line at Call anytime. It s available 24 hours a day, every day. 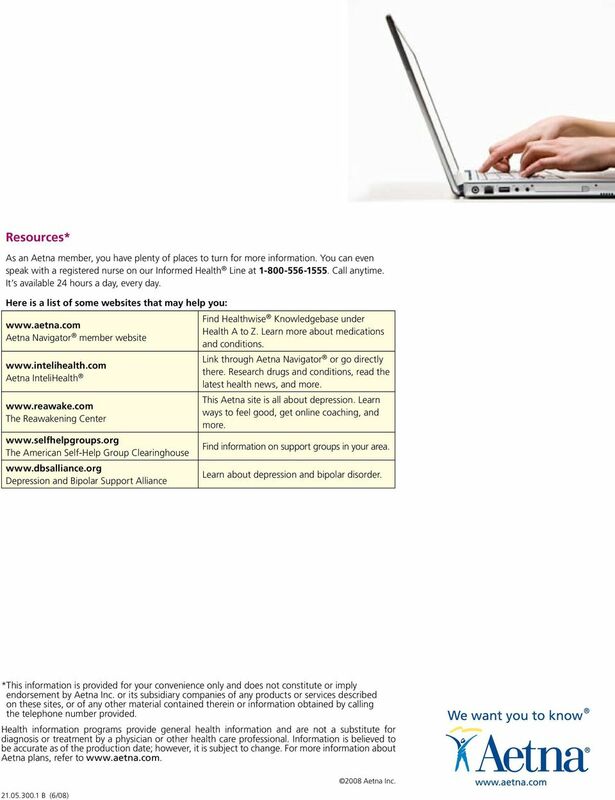 Here is a list of some websites that may help you: Aetna Navigator member website Aetna InteliHealth The Reawakening Center The American Self-Help Group Clearinghouse Depression and Bipolar Support Alliance Find Healthwise Knowledgebase under Health A to Z. Learn more about medications and conditions. Link through Aetna Navigator or go directly there. Research drugs and conditions, read the latest health news, and more. This Aetna site is all about depression. Learn ways to feel good, get online coaching, and more. Find information on support groups in your area. Learn about depression and bipolar disorder. * This information is provided for your convenience only and does not constitute or imply endorsement by Aetna Inc. or its subsidiary companies of any products or services described on these sites, or of any other material contained therein or information obtained by calling the telephone number provided. Health information programs provide general health information and are not a substitute for diagnosis or treatment by a physician or other health care professional. Information is believed to be accurate as of the production date; however, it is subject to change. 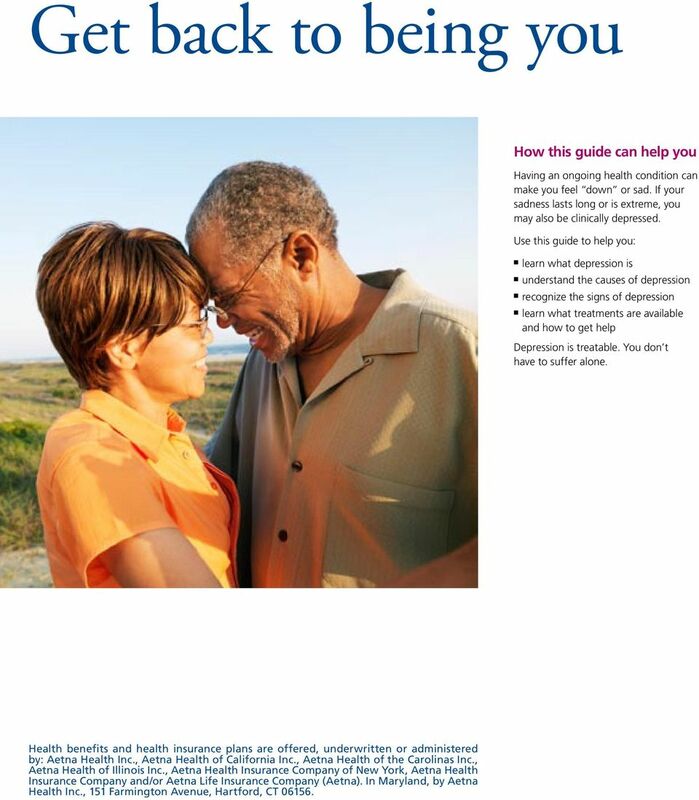 For more information about Aetna plans, refer to B (6/08) 2008 Aetna Inc.
A Depression Education Toolkit Facts about Depression in Older Adults What is Depression? Depression is a medical illness. When sadness persists or interferes with everyday life, it may be depression. Seniors and. Depression. What You Need to Know. Behavioral Healthcare Options, Inc.
Bipolar Disorder. Some people with these symptoms have bipolar disorder, a serious mental illness. Read this brochure to find out more. OUTREACH VERSION SERVICES FOR TEENS AT RISK STAR Center Western Psychiatric Institute and Clinic (412) 246-5619 All Rights Reserved 2007 UPMC Health System TABLE OF CONTENTS INTRODUCTION 2 WHAT IS DEPRESSION? Depression is a medical illness that causes a persistent feeling of sadness and loss of interest. Depression can cause physical symptoms, too. Depression & Multiple Sclerosis Managing specific issues Aaron, diagnosed in 1995. The words depressed and depression are used so casually in everyday conversation that their meaning has become murky. Bipolar Disorder. When people with bipolar disorder feel very happy and "up," they are also much more active than usual. This is called mania. Depression After Brain Injury A Guide for Patients and Their Caregivers Is This Guide Right for Me? Yes, if: You have experienced a mild, moderate, or severe injury to your brain due to a sudden trauma. Depression. Introduction Depression is a common condition that affects millions of people every year. The sooner a person with depression seeks support, the sooner they can recover. Michigan Depression Outreach and Collaborative Care (MDOCC) Over the past two weeks how often have you been bothered by any the following problems? Michigan Depression Outreach and Collaborative Care (MDOCC) PHQ-9 Over the past two weeks how often have you been bothered by any the following problems? 1. Little interest or pleasure in doing things? Because it s important to know as much as you can. D0100: Should Resident Mood Interview Be Conducted? 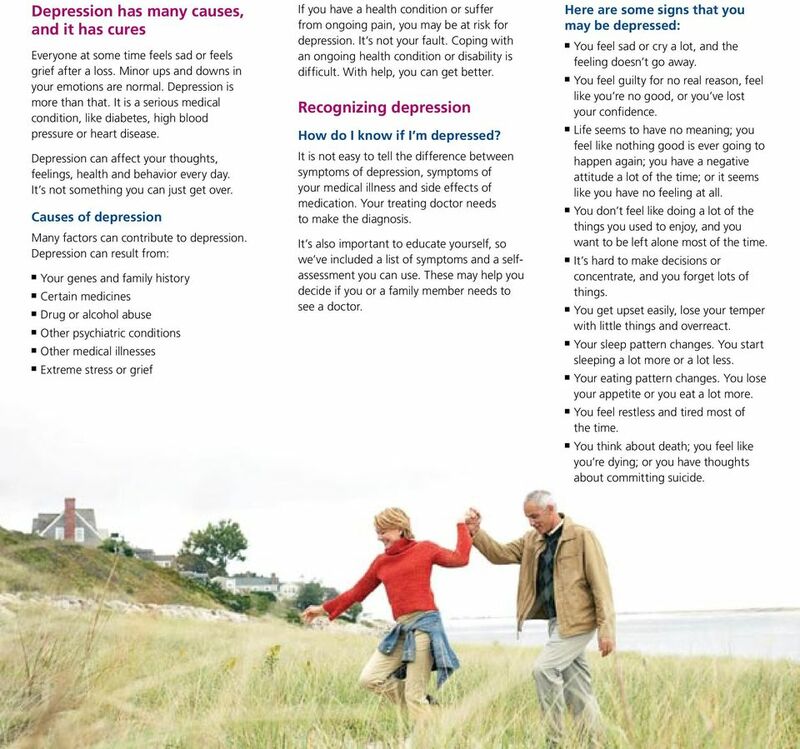 Older Adult, Family, and Caregiver Guide on Depression The Treatment of Depression in Older Adults Older Adult, Family, and Caregiver Guide on Depression The Treatment of Depression in Older Adults U.S.
ADOLESCENT DEPRESSION. What we know, what we look for, and what we do. Depression Q: What is depression? A: Life is full of ups and downs. But when the down times last for weeks or months at a time or keep you from your regular activities, you may be suffering from depression. Postnatal depression is an illness. It is not a sign that you don't love your baby or can't look after your baby properly. What you should know about treating your pain with opioids. Important information on the safe use of opioid pain medicine. DRUGS? NO THANKS! What are some of the leading factors that cause you to. become interested in experimenting with illegal drugs? More than just feelings of unhappiness, clinical or major depression is a mood disorder a medical illness that involves both the body and mind.